As inclusion becomes more and more of a priority, so does the need for organisations to develop a strategy or plan on inclusion. This blog shares 5 tips for getting started. A good starting point for developing an inclusion strategy is understanding how included your people feel right now. Measuring inclusion is a challenge (more on that later) but one way to gather some of the insights you need to inform your approach is simply to ask people how included they feel right now, what (or who) makes them feel included, and what might make them feel more included in the future. Simple it may be – but it’s surprising how little it happens. In our experience most people have never been asked those questions before. You need to model inclusion in how you go about developing your inclusion strategy. That means involving employees who may not typically have a voice on strategy development, and gathering insights from a diverse range of people about what makes them feel included – from junior staff as well as senior, from introverts as well as extroverts, from younger as well as older employees, from white men as well as women of colour. You’ll need a working definition of inclusion as you’re developing your strategy. We’re big fans of Catalyst’s work that defines inclusion as a function of ‘uniqueness’ (‘the perception that you are distinct from others and that your distinctiveness is valued by others in the group’) and ‘belongingness’ (‘the perception that you are part of a group, such as a work team, and that you are an essential part of the group’). People intuitively understand what this means, so it’s a great opener for a discussion about the meaning of inclusion for your organisation. You need to explore how different groups understand and experience inclusion. In our conversations about the meaning of inclusion we found that there’s a lot of similarity in what makes people feel included, and what inclusion means, but a lot of differences too. The differences show up across different demographic groups and also different sectors. One similarity? Wherever they work, and whoever they are, employees feel included when they get asked for their opinion, and their opinion gets listened to. One difference? Working towards a shared vision of the future is motivating, but it’s not a driver of inclusion for everyone. Finally, you’ll need to find the right language in which to define inclusion for your organisation. We were particularly proud of the language we developed with one client to describe what inclusion meant to them. We tried it out with another client in another sector and guess what? It simply didn’t work. It didn’t fit. The words didn’t capture what made people in that organisation feel included. Just like diversity, there is no one-size-fits-all on inclusion either. But getting employees involved from the start in defining and framing your approach will get you closer to developing a strategy that works. This entry was posted in Uncategorized and tagged #strategy, inclusion on 22 June 2018 by forbusinessake. It was a play by Irish playwright Samuel Beckett. Or rather, it was a Saturday-night performance of Beckett’s one-person play Not I by two people: Jess Thom, artist, communicator, comedian and neuro-diverse disability activist with Tourette’s syndrome, and Charmaine Wombwell, a British Sign Language (BSL) performer. And it wasn’t just the performance. It was the whole evening. It was a film and a conversation about the play, about disability, about neuro-diversity and about humour too. And it was Jess herself. I know just how hard it can be to design and deliver workshops on diversity and inclusion that make a real difference to how people think or act. I don’t think I’m the only person (consultant, facilitator, coach on diversity and inclusion) who feels like that. But Jess’s performance made a difference to me. So for those of you who are designing or delivering inclusion workshops, or are more generally interested in how to create an inclusive culture where you work, here are three things that made Saturday night the best inclusion workshop I’ve been to. One of the things that makes a culture inclusive is respect for difference. Disability and neurodiversity were respected – not just respected, but celebrated – to the max on Saturday night. It began before we even arrived: when I booked the tickets I noted how the performances were described as ‘relaxed’, which Jess’s website defines as offering ‘a warm welcome to people who find it difficult to follow the usual conventions of theatre behaviour. This can include: people with learning disabilities, movement disorders, autistic spectrum disorder, other neurological conditions, those with young children or babies, and of course, people with Tourettes’. In fact a relaxed performance seems like good news for everyone: we were all encouraged to move around the studio as much as we wanted, to be noisy and comfortable, at any time. Other examples of respecting difference: Jess and Charmaine told the audience what was going to happen at the beginning of the performance – how long each section would last, what we’d be doing and when. For some people that kind of information is vital to their ability to participate. It helped me too. It allowed me to stop worrying about whether we’d make the train home, and be fully in the room for the duration of the play. And Charmaine was on the stage with Jess throughout, translating the play and Jess’s performance and conversations with the audience into BSL. She wasn’t on the margins but core to the performance. Another thing that makes for an inclusive culture is a sense of connectedness with other people. There was a big emphasis on making connections and building meaningful relationships on Saturday night. Some of the things that got me thinking about this: the way in which Jess and her team warmly welcomed us into the theatre with personal greetings and an invitation to sit where we wanted. The encouragement we were given to get to know audience members sitting next to us. The diversity, range of expertise and experiences of the people who were shown coming together to create the production, from grime artists to costume makers specialising in the use of lights (who knew?). Jess’s warmth and humour which made her instantly likeable. And her openness about living with Tourette’s and her invitation to ask any question we liked. The feeling that we all belonged, that we were meant to be there together, at least for as long as the performance lasted. The third thing that helps with inclusion is raising awareness. The evening was hugely informative about Tourettes, which is a neurological condition affecting Jess and more than 300,000 children and people in the UK. I’d really encourage you to visit Jess’s website to find out more. It’s not about uncontrolled swearing, which is how I’d misunderstood it. A key feature of Tourettes is that people make involuntary and uncontrollable sounds (vocal tics) and movements (motor tics) multiple times a day. Jess’s vocal tics include ‘hedgehog’, ‘biscuit’ and ‘sausages’. Jess says on her website that ‘It’s possible to suppress tics for a while, but eventually they have to be let out. I often tell children this is a bit like how it feels if you try not to blink’. As the mother of teenage children I really felt it when Jess described how as a teenager she used to try to hide her tics, and would disappear to the loo every few minutes to let them out. And it was powerful and moving to hear Jess describe how learning about the social model of disability – which says people are not disabled by their condition but by the failure of the world around to take account of difference – had been a massive liberation, transforming her sense of herself, and her life. Saturday night reminded me about learning about inclusion through the experience of being included. It brought home to me – again – that there’s nothing more powerful than connecting with someone’s personal experiences to help raise awareness and understanding. And it made me wonder how I might incorporate at least some of the guidance for a relaxed performance the next time I facilitate a workshop or a meeting. For more information visit Jess’s website on https://www.touretteshero.com/: ‘a place to celebrate the humour and creativity of Tourette’s’. This entry was posted in Uncategorized on 19 March 2018 by forbusinessake. It took about 30 seconds. The next day, Wednesday 4 January, I forgot to fill in the diary. This morning, Thursday 5 January, I realised I’d forgotten. It wasn’t that there was nothing to appreciate yesterday. I just forgot to. I talk about appreciation a lot, and about the contribution which appreciating difference makes to diversity and inclusion. But yesterday’s forgetting reminds me that just like inclusion, appreciation doesn’t just happen. Simply remembering to appreciate can be the first challenge. This entry was posted in Uncategorized on 5 January 2017 by forbusinessake. It was terrific to partner with the Royal Academy of Engineering and the Science Council in 2016, to create a new tool on diversity and inclusion for professional engineering institutions and scientific bodies (the professional bodies of the science and engineering worlds). 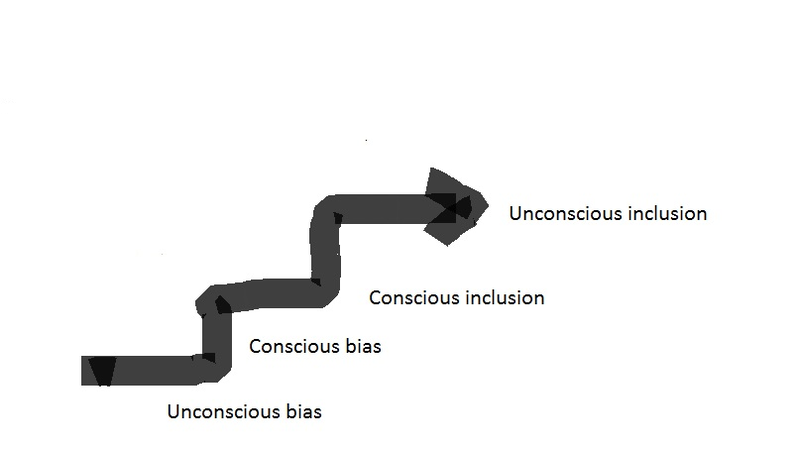 The process of developing the first ever bespoke Progression Framework on diversity and inclusion for the professional bodies was a truly collaborative – and rewarding – experience, not only between scientists and engineers, but between all of those involved in the Steering Group, and the companies who piloted the Framework in its final stages, and of course collaborators with for business sake too. ‘But what is a progression framework?’, I hear you ask. Well, this one is a bespoke diversity and inclusion ‘maturity model’, which describes generically what progress on diversity and inclusion looks like for professional bodies at four levels of attainment, from Level 1 to Level 4. We called the four levels Initiating, Developing, Engaging and Evolving. It’s also a step-by-step account of what each level of attainment means in practical terms for eight functional areas in the everyday work of these organisations, from leadership and governance to marketing and communications. In this way the Progression Framework helps people working day-to-day see what they can do to ‘mainstream’ or ‘integrate’ diversity and inclusion into their areas of the business. You can download an overview of the Progression Framework and examples of each level of attainment for each functional area by clicking on this link. for business sake’s chief collaborator and 50:50 partner on this work was Dr Gillian Shapiro, whose site you can visit here: Shapiro Consulting ltd. As ever it was wonderful to work with her. Helpful advice and new insights were also provided by Tony Belgrave of Positive Deviant and Helen Wollaston, Director of WISE. Wishing you all a collaborative 2017! This entry was posted in Uncategorized on 21 December 2016 by forbusinessake. I had a fascinating time in 2015, working as a consultant on gender equity, diversity and inclusion with the United Nations High Commissioner for Refugees (UNHCR) in Geneva. My task was to help UNHCR review and refresh its approach on gender equity, diversity and inclusion for the 9500 staff who work to safeguard the rights and well-being of millions of ‘displaced persons’ (refugees, migrants, asylum seekers, stateless and internally displaced people) right across the globe. I’m often asked ‘what’s new, what’s coming up?’ in workplace diversity and inclusion – and after working in UNHCR I say this is what’s coming up – refugee and migrant inclusion. At the same time that I had all the luck and the opportunity to work in Geneva, one million migrants were struggling to Europe across land and sea, many fleeing war, conflict and persecution in Syria, Afghanistan and Iraq. 290,000 migrants had their applications for asylum in Europe approved in 2015. Not all refugees will want to work or be capable of doing so, but many will, and will have the skills, experiences, talent and aspiration which European business needs. To help make entry into the labour market a success, business will need to take the learning from established approaches to inclusion on gender, ethnicity, disability etc and apply these to refugee inclusion too. And starting small, starting now, makes sense, by helping to challenge stereotypes, misinformation and fear that exist, and in practical terms by recruiting refugees into roles that make use of their skills and experience. Second, there’s a strong business case for corporates to do what they can to facilitate refugee inclusion, as well as a moral imperative. It’s partly about businesses making the most of the talent and experience which refugees bring (a study showed 78% of Syrians arriving in Germany in during 2013 to 2014 were middle class and well-educated) and partly about building relationships with refugees as future consumers and customers. In Refugee Economies Alexander Betts and his colleagues highlight the numerous other ways in which refugees can benefit host economies as ‘producers, consumers, employees, beneficiaries, lenders, borrowers and social entrepreneurs’. Third, I’ve been struck by how little visible engagement there is from business in the refugee crisis, in Europe at least. There are examples of employers doing good work to raise money, build capacity and develop skills (such as the signatories to this UN pledge and those supporting the Tent foundation) . But overall as journalist Gillian Tett wrote in the Financial Times, early in 2016: ‘the voice of business has been extraordinarily muted, if not absent, from this wider policy debate’. I understand why. It may not be the clearest or most pressing or politically most comfortable place for business to be. But refugee inclusion is not going away, and getting business leaders round the table with the humanitarian sector for a conversation that begins ‘Refugees are our business, too’ feels to me morally and commercially like the right thing to do. If this is of interest to you too, please do get in touch. This entry was posted in Uncategorized and tagged refugeeinclusion on 21 April 2016 by forbusinessake.